Department of Medicine, Division of General Internal Medicine (Ringrose), Department of Radiology and Diagnostic Imaging (Jen), Department of Laboratory Medicine and Pathology (O’Hara) and Department of Medicine, Division of Endocrinology (Toth), University of Alberta, Edmonton, Alta. A 21-year-old woman of El Salvadorian descent (born in El Salvador, with immigration to Canada at age three years), presented with a deformity of the right humerus in December, thought to have occurred following minor trauma. Radiography showed a fracture. She had a positive result on a pregnancy test in January. She experienced abdominal pain the next month, and a ureteric stone was diagnosed. At that time, alkaline phosphatase was 1434 (normal 30–130) U/L; serum calcium was not measured. In June, when the patient underwent follow-up radiography for the previously reported fracture, the image showed an aggressive-appearing lytic lesion in the proximal right humerus (Figure 1). Magnetic resonance imaging (MRI) showed numerous other bone lesions involving the scapula and ribs. The scapular and humeral lesions (Figure 2) were sampled for biopsy, and the pathology report suggested giant cell tumour of bone. In September, after delivering a baby that was small for gestational age but otherwise healthy, the patient underwent follow-up imaging with MRI, plain radiography and bone scanning. The findings of these investigations were suggestive of metabolic bone disease, with multiple brown tumours in both the axial and appendicular skeleton (Figure 3), rather than giant cell tumour. No treatment was initiated at that time. Radiograph of the right humerus of a 21-year-old woman. Large lytic lesions are apparent in the humeral head, neck and distal metaphysis and in the scapula. Biopsy specimen of the humeral lesion shows giant cells (hematoxylin and eosin; original magnification ×100). Bone scan showing disseminated multifocal cold lesions superimposed on a diffuse pattern of metabolic bone disease (increased calvarial uptake, prominence of costochondral junctions and subtle increase in the ratio of bone to soft-tissue activity). WB = whole body. Four months after the delivery, the patient was admitted to hospital following a motor vehicle collision. A minimally displaced pelvic fracture was suspected on pelvic radiography. However, the trauma of the collision was minor, and it was unclear whether the lesion seen radiographically was a fracture or a manifestation of the previously suspected metabolic bone disease. Serum calcium was elevated, at 3.43 (normal 2.10–2.60) mmol/L, as were alkaline phosphatase (1046 [normal 30–130] U/L), parathyroid hormone (244.4 [normal 1.1–6.8] pmol/L [1 pmol/L = 9.49 ng/L]) and urine calcium (29.4 [normal 2.0–7.5] mmol/day). Serum 25-hydroxyvitamin D was reduced, at 9 (normal 80–200) nmol/L. Serum albumin was within normal limits. Although the patient was not pregnant, the level of human chorionic gonadotropin was 92 (normal < 5) U/L, which raised concerns about parathyroid carcinoma. However, subsequent single-photon emission computed tomography and parathyroid scan confirmed parathyroid adenoma (Figure 4). The bone lesions seen on imaging were thought to be secondary to osteitis fibrosa cystica, a complication of primary hyperparathyroidism. The patient had no family history of hyperparathyroidism or endocrine diseases. Single-photon emission computed tomography shows a solitary active parathyroid adenoma directly posterior to the trachea and right lobe of the thyroid. Because of its unusual location (posterior rather than inferior to the right thyroid lobe), the adenoma was not clearly visible on conventional planar images. It was precisely localized with this mode of imaging. The patient was referred to endocrinology and then to surgery. She underwent exploration of the parathyroid and excision of a right superior parathyroid adenoma. Biopsy of the left inferior parathyroid gland showed a normal appearance. The left superior and right inferior parathyroid gland were both visualized and appeared normal. The patient returned to the recovery room and then the general ward in good condition. Intraoperatively, parathyroid hormone fell to 25.3 pmol/L, and the next day it was 1.6 pmol/L, with human chorionic gonadotropin of 11 U/L. 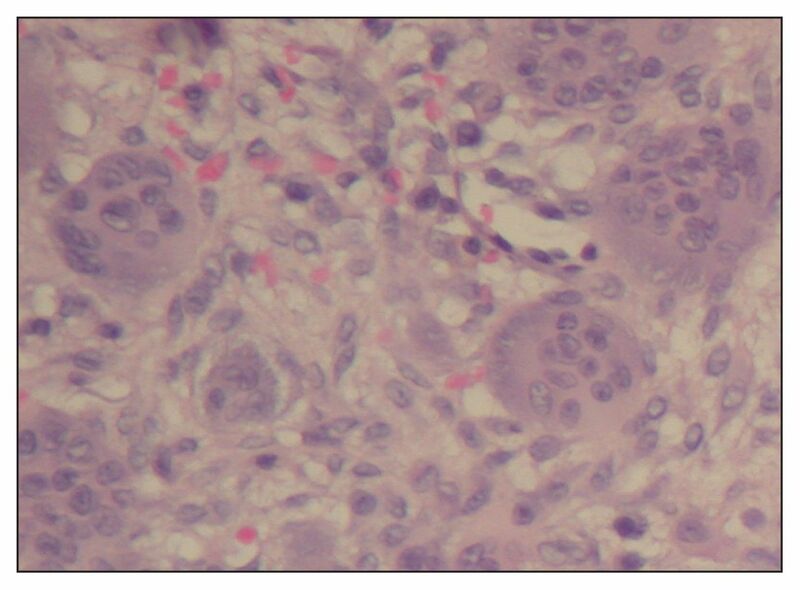 The pathology report confirmed parathyroid adenoma, with a minority of the cells (1%) staining for human chorionic gonadotropin. The patient was discharged on the third postoperative day, and the postoperative course was complicated by a full year of severe bone hunger. Four months after surgery, the patient’s calcium level was low, at 1.46 mmol/L, despite 2400 g of oral elemental calcium daily and 0.25 μg (10 IU) of 1,25-dihydroxyvitamin D3 three times daily. After 1250 μg (50 000 IU) vitamin D2 daily was added to the regimen, calcium levels improved to 1.67 mmol/L. One full year after surgery, the parathyroid hormone level remained elevated, at 20.0 pmol/L, calcium had normalized to 2.14 mmol/L, and alkaline phosphatase was 180 U/L. About a year after surgery, the 1,25-dihydroxyvitamin D3 supplementation was discontinued, and the dosage of vitamin D2 was decreased to 1250 μg (50 000 IU) twice weekly. She continued the calcium supplementation. Human chorionic gonadotropin was undetectable at that time. Almost two years after the surgery, levels of parathyroid hormone, calcium and alkaline phosphatase were all within normal limits. The patient was lost to follow-up until the following year, after the birth of her second child, when her 25-hydroxyvitamin D level was 77 nmol/L (indicating mild to moderate deficiency); calcium and parathyroid hormone levels remained normal. Follow-up radiography over the next few years continued to show residual deformities (expansile lesions) from the previously active metabolic bone disease. However, there was some regression relative to the preoperative films. We have presented a case of primary hyperparathyroidism that initially came to medical attention upon discovery of an expansile bone lesion, originally thought to represent malignancy. The eventual diagnosis was parathyroid adenoma complicated by osteitis fibrosa cystica. The dramatic radiologic presentation, a consequence of severe hypercalcemia and substantially elevated parathyroid hormone, was likely exacerbated by superimposed vitamin D deficiency. The cure for symptomatic primary hyperparathyroidism is parathyroidectomy, but there are no formal guidelines for the specific treatment of osteitis fibrosa cystica. A recent review of primary hyperparathyroidism suggested maintaining 25-hydroxyvitamin D levels above 50 nmol/L and ensuring adequate calcium intake in patients with asymptomatic hyperparathyroidism, given that parathyroid overactivity may be exacerbated by low levels of 25-hydroxyvitamin D and low calcium intake.2 As for people without hyperparathyroidism, it seems reasonable to aim for vitamin D sufficiency, normocalcemia and adequate calcium intake after parathyroidectomy to achieve maximal regression of bone lesions in osteitis fibrosa cystica. The long-term prognosis of osteitis fibrosa cystica following parathyroidectomy is difficult to predict. In the patient described here, follow-up plain radiography showed some regression of the lesions. Others have reported similar regression with calcium and vitamin D replacement.6 When last measured, our patient’s vitamin D level was in the mild to moderate deficiency range, which might delay further regression. The patient described here had severe vitamin D deficiency (initial 25-hydroxyvitamin D 9 nmol/L) in addition to her primary hyperparathyroidism. 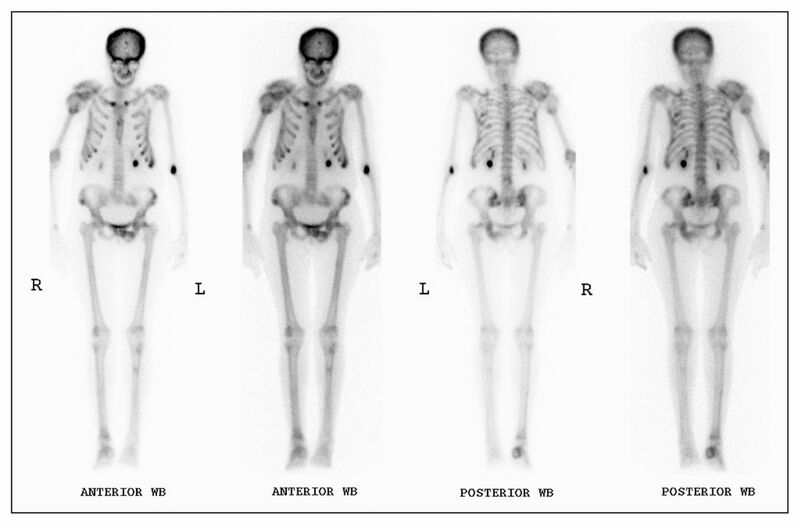 It has been proposed that superimposition of vitamin D deficiency on primary hyperparathyroidism may contribute to the development of skeletal lesions,1 as was seen in this patient. Primary hyperparathyroidism has been associated with 25-hydroxyvitamin D deficiency. In the setting of concomitant 25-hydroxyvitamin D deficiency, higher levels of parathyroid hormone and calcium, more severe disease and higher markers of bone turnover, such as alkaline phosphatase, have been seen.7 With concomitant vitamin D deficiency, there is also an increased risk of hungry bone syndrome following parathyroidectomy,8 as was experienced by our patient. In our patient, the bone complications of primary hyperparathyroidism (i.e., osteitis fibrosa cystica) were evident at initial presentation; however, definitive diagnosis and treatment took one year. Multiple factors likely contributed to this delay in diagnosis. The patient described here was somewhat reticent in seeking and maintaining medical attention. In addition, biochemical correlation for the pain and lesions seen on initial radiography was delayed. In particular, serum calcium was not measured until one year after the initial presentation. In retrospect, the ureteric stone was probably a complication of the hypercalcemia. Measurement of serum calcium at the time the stone was diagnosed might have helped in making the diagnosis earlier. The elevated alkaline phosphatase was perhaps attributed to the patient’s pregnancy, but might have signalled the need to measure serum calcium, phosphate, parathyroid hormone and 25-hydroxyvitamin D.
When osteolytic lesions are seen on radiography, measurement of serum calcium, albumin, phosphate and parathyroid hormone, along with serum protein electrophoresis, may help to differentiate metabolic bone disease from malignancy. Vitamin D deficiency may increase the likelihood of skeletal lesions in primary hyperparathyroidism. Contributors: Dr. Ringrose drafted the manuscript and coordinated all revisions. Dr. Toth assisted with editing the manuscript, particularly the endocrinology-related content, and was directly involved in the patient’s care. Dr. Jen assisted with editing the manuscript, provided expert advice regarding the radiology-related content and provided the radiologic images. Dr. O’Hara assisted with editing the manuscript, provided expert opinion regarding pathology-related content and provided the pathological image. All authors approved the final manuscipt and agree to act as guarantors of the work.
. Case records of the Massachusetts General Hospital. Case 16-2008. A 46-year-old woman with bone pain. N Engl J Med 2008;358:2266–74.
. Primary hyperparathyroidism. N Engl J Med 2011;365:2389–97.
. Disseminated brown tumors from hyperparathryroidism masquerading as metastatic cancer: a complication of parathyroid carcinoma. Am Surg 2001; 67:951–5.
. Unique clinical characteristics of primary hyperparathyroidism in India. Br J Surg 2001;88:708–14.
. Primary hyperparathyroidism with brown tumor mimicking metastatic bone malignancy. J Chin Med Assoc 2010;73:177–80.
. Regression of skeletal manifestations of hyperparathyroidism with oral vitamin D. J Clin Endocrinol Metab 2006;91:2480–3.
. Diagnosis of asymptomatic primary hyperparathyroidism: proceedings of the third international workshop. J Clin Endocrinol Metab 2009;94:340–50.
. Vitamin D deficiency and primary hyperparathyroidism. J Bone Miner Res 2007;22(Suppl 2):V100–4.
. Clinical problem-solving. A problem in gestation. N Engl J Med 2011;365:843–8.
. Primary hyperparathyroidism in pregnancy: evidence-based management. Obstet Gynecol Surv 2002;57:365–76.
. Clinical update: sporadic primary hyperparathyroidism. Lancet 2007;370:468–70.
. Primary hyperparathyroidism in the young age group: particularities of diagnostic and therapeutic schemes. World J Surg 2004;28:1153–6.